The Silicon Valley Sprint triathlon was this past Saturday, as all my wonderful loyal readers know, and it was AMAZING! I kid you not, it was the most perfect day for a race, and even though it was physically grueling and mentally difficult, it was FUN! I was quite nervous before the race. I set up my transition area, got body marked, then started my prep. I made my way down to the swim beach and dipped my toes into the lake to find out it was pleasantly warm! It was still full of duck poop, but the ducks and geese had smartly taken refuge elsewhere, so that wasn't in the forefront of my mind. I felt a little lonely and nervous while I waited in the water for my wave to begin, so I got to chat it up with some nice people milling about, which made the time go by quick, and then BAM, the swim portion began. All of my training went out the window as my goggles were fogged up and I could barely see. I started in the back of the pack to avoid being swam over, but that didn't stop it from occurring. I spent the first quarter of the race stroking with my head above water, water polo style, and that made me tired but at least I knew where I was going. I finally just gave in and put my head under and began a 2-stroke, breathe, sight style, which is a little odd as I am used to a 3-stroke, breathe style. I swam the whole way, catching a few of the slow swimmers from the wave before mine, and was impressed with my 19:26 time for the half mile swim portion. Not so impressive are the photos of me coming out of the water. I only included the one you can't actually see my face in, as I was tired and looked pooped! My transition 1 time was 3:22 not excellent, and far slower than I had been practicing at home, but dry socks do not slip onto wet feet, and my transition area was super far from the beach so I had a ways to travel. The bike portion was excellent. I popped a shot block once I had caught my breath, guzzled lots of water, than began picking riders off. I am super competitive, so I would look for the ages on the calves of the girl riders in front of me, and if they were in my age group, I would try hard to pass them. I did great on the 1.5 mile hill climb at mile 7, as I have been doing all my training rides on this course, so I passed quite a few people, in my age group and otherwise. My 14 mile bike time was 51:24, by far my best time on this route! 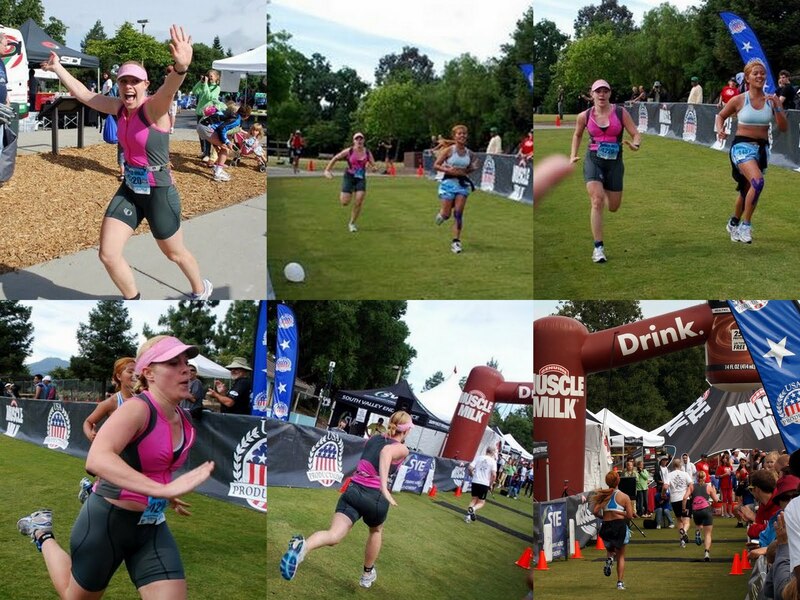 Check out my bulging quad muscle in picture 2, I can't believe these are my legs, training does a body good! My friend's hubby caught the smiley picture of me just as I was leaving the park on the course, and I LOVE it! The run is definitely my strongest point, as I have been training that the longest. I felt really heavy and slow coming out of T2, but I found a pace and stuck with it. I grabbed water at the first aid station, but nearly choked trying to sip it, so I decided against any more later on. I had my watch on so I was keeping track of my pace, and it was totally within range of my training runs, which was a surprise since I had already done so much. The last half mile I picked up my pace, then sprinted into the final bit with all I had. That little bit turned out to be pretty impressive, everyone kept commenting on how fast I came in. 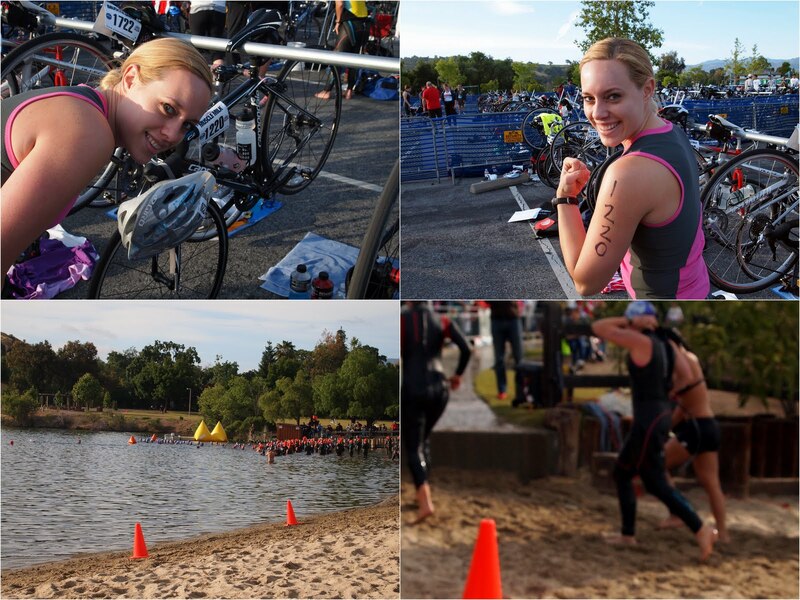 The photos show me behind, next to, passing, then totally ahead of an Asian girl with orange hair, it's pretty funny. My 5k run time was 26:43, I think a race PR for for me! I came in 5th in my age group, 38th for women, and 151st out of 348 overall in the race. 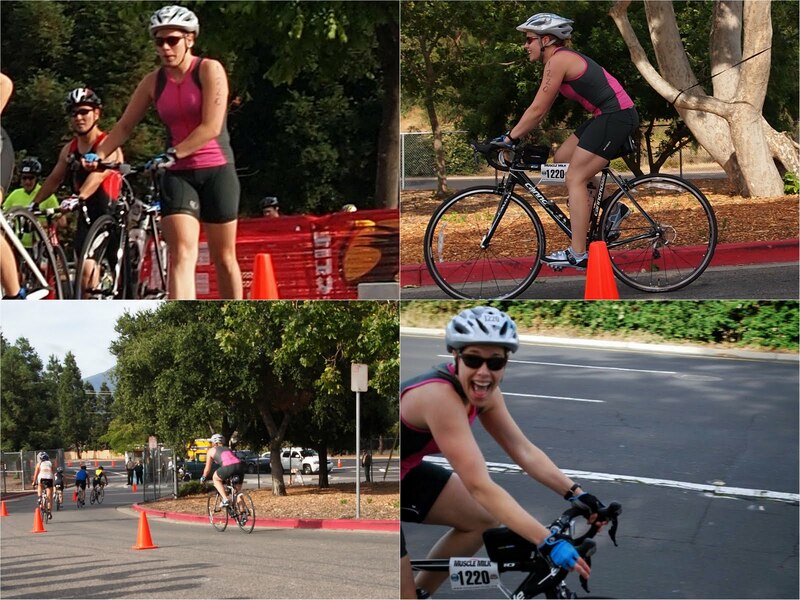 I was also only 9 minutes slower than the 1st place finisher in my age group, so I have a goal for the next triathlon! See, competitive much?! On race day I had Billy, my mom, my friends Lexie, Diane, Sarah and her hubby Brandon, Tiffany and her hubby Tom show up to support me! I was also bombarded by love and luck through phone calls, text messages, Facebook, Twitter, and blog comments from so many awesome people. I felt incredibly lifted up and supported, it was amazing, thank you everyone! I only got a picture with Miss Tiffany post-race, but had my brain been anything but caffeinated mush I would have gotten pics with everyone! Why yes, I did have a bagel in my hand for this picture, it's all about priorities people, and eating carbs after a race is tops! Also notice bulging bicep muscle. This post is full of me showing off, I swear! YAY!!! I was waiting for this post! You rocked it Adrian. I love all these pictures. And you were sprinting across that finish line! PR and all! Whoo hoo! Good work. I bet you feel SO great! Congrats, super happy for you! holy moly girl! you're amazing! Congratulations on smashing your goal time! Love all of the pictures! Seriously love this this post Adrian. AWESOME JOB! I am so proud of you- I could absolutely not do that! Keep up the hard work!! You rock! Wooooooooo!!! You did it!! Loved your recap- shows how you went through all the emotions! PS- LOVE the overtaking shot haha!! AMAZING JOB! You are bad a**! I don't think swearing is blog-commenting appropriate, but I had to this time. So proud of you, Adrian! That is AWESOME! I can't believe you did that and with such an amazing time. Congrats! Awesome job on the 5K PR!! You must be over the moon with your results!! Holy cow Adrian! You killed that race (how could you not with those super bulging muscles??) 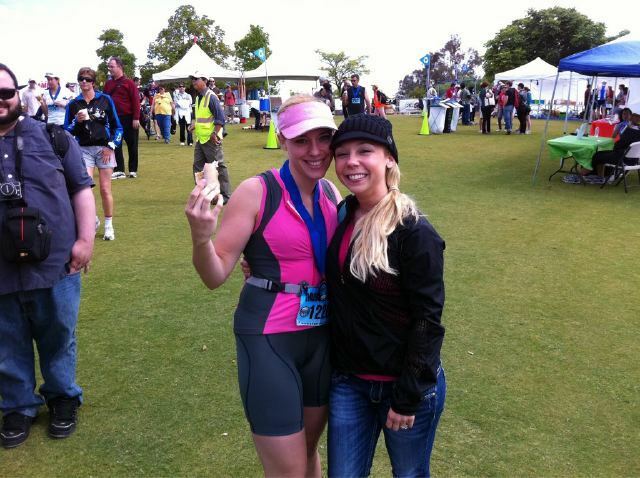 And geez, you look so fresh after the race! Great job!